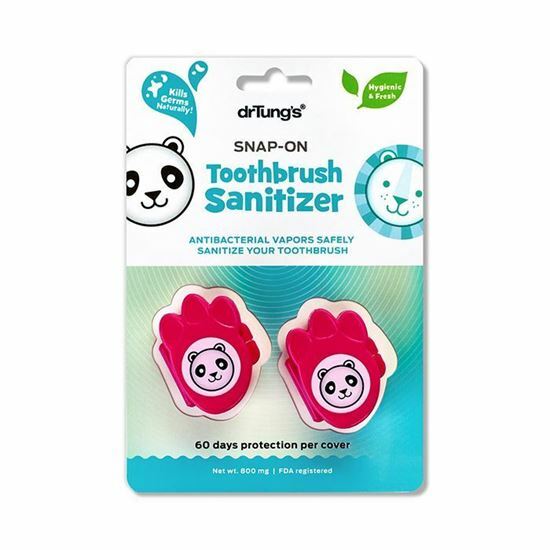 Dr Tungs Snap On Sanitizer Kid is a revolutionary product that releases all-natural, anti-bacterial vapors to kill germs and safely sanitise your toothbrush between brushings. Toothbrushes harbour a host of harmful bacteria that can re-infect your mouth when you brush. Our Snap-On Sanitizer is a revolutionary product that releases all-natural, anti-bacterial vapors to kill germs and safely sanitise your toothbrush between brushings. No mess, no fuss, dry vapour action which fits most manual and power brushes. No electricity or batteries required. Ideal and convenient for home and travel. At least 60 days protection per sanitiser & FDA registered.